Oregon is HOT in our neck of the woods. Usually, summer days aren’t filled with temperatures nearing 100 or humidity starting the day at 70% or more. We’re accustomed to average summer temps in the low to mid 80’s, low humidity, and nights cooling down into the 60s or even high 50s. Mornings now you can hear the sounds of neighbors doing what you’re doing–opening windows and doors to let the cool morning air in. At our place, in Meyers Woods, this will keep the house cool throughout the day with the help of shade from our old growth firs and cedars. Many older homes in the area have no air conditioning. Oregonians are somewhat complacent thinking that global warming isn’t going to affect the Pacific NW. Best we think again, dear neighbors! Back in the day, the 1950s. There was no evidence of air conditioning in any of the homes on our block. None anywhere we knew about. But people fared the summer weather without a hitch. I grew up in Nashville, TN. The south offers a hot summer for the most part. The humidity can often be as high as the temperature. Mosquitoes are everywhere. Unlike Oregon and the NW, summer nights in Tennessee didn’t cool off much. But I didn’t mind. I counted lightning bugs and stars until Mama or Daddy called us at bedtime. 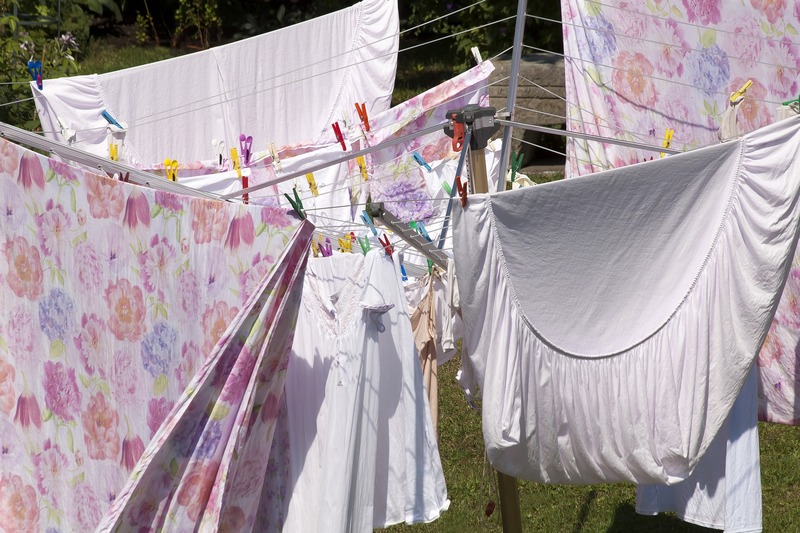 Monday was wash day at our house, and Mama laundered sheets and pillowcases. A favorite activity was handing her the clothespins, or some call them clothes pegs, for hanging the wash. Going to bed with air-dried linens made summer nights a delight! Hot Nights Meant Bedtime Delight. Windows were open as far as they would go. Hopes were high for a slight breeze or a hefty draft blowing through. I could hear Mama using the Coca-Cola bottle she used to dampen clothes for ironing. This signaled the preparation of cooling sheets, as she called them, for the long, hot night. Each sheet was dampened as much as she felt necessary to keep us cool enough to fall asleep. When she brought the sheet to you, Mama carefully laid it over you spreading it to its full size. Now the hope for breezes was at its peak. And as soon as someone felt a breeze, the whole house knew–there was either a long “ahhhhhhhh,” or a giggle, or one big yawn. It was time to fall asleep and dream dreams. What memories do you have hot summer nights? Perhaps there’s something you’d share with us in the comments below, or perhaps this is good fodder for a short writing piece you’ve been putting off. Either way, my hope is that it’s not so hot where you are that you can’t sleep! Sweet dreams! It’s hot in Florida, but it always is in August. This week my Lancaster County, PA Facebook friends confessed to a temperature of 105! I saved the clothes-on-the-line pic to my Pinterest account, and I remember dampened clothes rolled up in the fridge for ironing. My fondest memory: collecting lightning bugs in a jar. Great post, Sherrey! 105 in Lancaster, PA? One of my favorite vacation trips was to Lancaster, but it certainly wasn’t that warm. Many mementos from that trip decorate our home. Marian, you are so faithful to support and encourage me during my struggles with being a constant online. I’m pleased you liked the clothes-on-the-line picture, and we share a “fondest” memory: collecting lightning bugs in a jar. I’m off to visit you at your latest post.